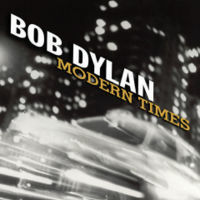 Bob Dylan’s new album, Modern Times, will be released next week in the United States. But it was released today here in Australia (they don’t call this the “lucky country” for nothing! ), so I hurried off to get a copy, and I’ve been listening to it all day. Without wanting to spoil too many surprises for my American friends, let me just say that this is a stunning, magnificent album – even better than I had hoped. In one song, Dylan taunts: “You think I’m over the hill, think I’m past my prime” – if that’s what you’re think, then every song on this album will prove you wrong. By the time you get to the eighth track, “Nettie Moore,” you think the album has reached its climax. But nothing could prepare you for the final track, “Ain’t Talkin’” – a powerful, haunting apocalyptic epic which is as good as anything Dylan has written in the last 15 years. As on his previous two albums, Time out of Mind (1997) and “Love and Theft” (2001), Dylan remains preoccupied with themes like love (“A lifetime with you is like some heavenly day”), ageing (“Hand me down my walkin’ cane”), memory (“I’m haunted by things I never meant or wished to say”), sin (“Got a pile of sins to pay for and I ain’t got time to hide”), failure (“My mule is sick, my horse is blind”), cities (“The bright spark of the steady lights has dimmed my sights”), social decay (“The world has gone black before my eyes”), and apocalypse (“… in the last outback at the world’s end”). “Today I’ll stand in faith and raise the voice of praise.